Just want to share with you today a card that I made yesterday morning. I didn't get the chance to post it yesterday so here it is. Since I'm trying to win my mojo back, I just made a clean and simple card to start off. The image was from House Mouse Christmas set and the sentiment was from Hero Arts Cupcake set. Fairly simple, just a punched border and some pearls to adorn the card. The image btw, was stamped and heat-embossed with clear ep then coloured with Copic markers. 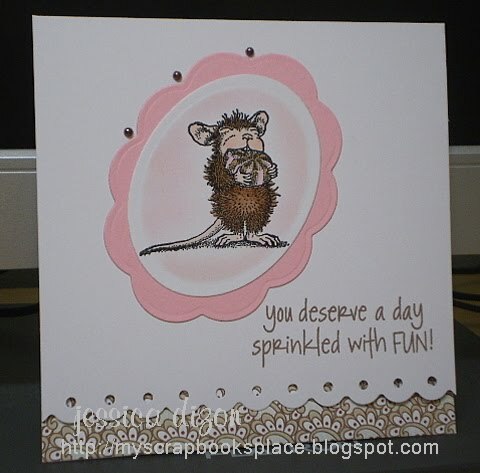 I also did some soft sponging using a dauber and Versacolor Petal Pink ink. That's all for now. Will try to make a 2nd post later for the card that I created for SC293 over SCS. What a gorgeous CAS card Jhet!! Cute image and love the oval on the angle! !